It's easy to take vision for granted when the eyes perform flawlessly. However, when eye problems crop up, it's hard not to wonder how the eyes work. In a properly functioning eye, a number of elements must cooperate perfectly to create good vision; just one malfunctioning factor in this instantaneous process can cause blurry vision, pain or even blindness. The entire field of optometry is dedicated to managing vision problems and determining the best method of correcting poor vision. Vision begins when light rays are reflected off objects and into the eyes via the cornea, a transparent bulge that covers the front of the eyeball. The cornea refracts, or bends, the light rays so that they pass through the dark, small round hole, called the pupil. The amount of light permitted to enter the pupil is regulated by the iris, the colored part of the eye that changes the size of the iris. After passing through the pupil, the light rays shine through the lens. This remarkable component changes it shape to bend the rays as needed to focus them on the retina located at the back of the eyeball. 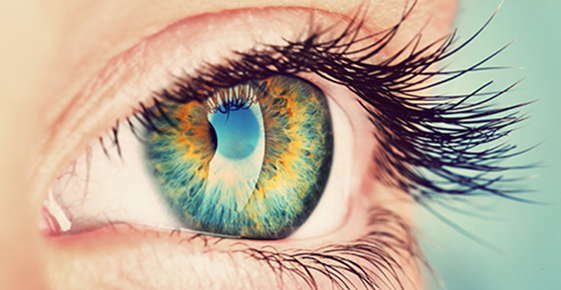 The retina is composed of millions of two types of nerve cells that detect the light. Cones are found primarily in the center of the retina, in a region called the macula, and specialize in sharp vision with fine details and colors. Rods reside beyond the macula to provide peripheral (side) vision, detect motion outside the central vision, and provide vision in dim or dark lighting conditions. Both cones and rods convert the received light rays into specific patterns of electrical impulses to be delivered to the brain through the optic nerve. In the brain, the impulses are assembled and decoded to form an image. The overall shape of the eyeball ultimately determines how well the eye can focus and receive the incoming image; when a patient experiences poor or blurry vision, an optometrist exams the eye to figure out what went wrong. Normally, the eye retains a spherical shape. If the shape changes, such as with an elongated eyeball, the cornea's curvature will no longer focus the incoming light rays appropriately to match the distance from the lens to the retina. Consultation with an optometrist can determine whether corrective lenses or surgery are needed to restore properly focused vision. American Optometric Association (2013). How Your Eyes Work. At Eye Care Professionals, LLC, we value your time. In an effort to save you time in our office, you can download and complete our patient form(s) prior to your appointment.